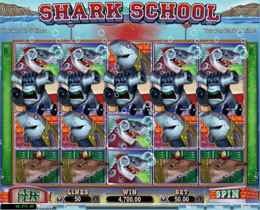 Shark School – 5 Reel, 50 variable Paylines video slot including Wild and Scatter symbols, Multipliers with 3 different Free Spins Bonus rounds. The top Jackpot payout is 1 500 coins. This game takes place in an underwater sea-school where cute and comical little fish learn how to avoid getting eaten by sharks. The game has the best quality 3D graphics and sounds. Coin size vary from 0.01 up to 0.50 with a maximum of 5.00 per payline. The maximum bet per spin is up to up to 25.00 when all 50 lines are wagered. The Octopus Wild acts as a substitute symbol for all the other symbols including the scatters. The scatter symbol is the key symbol triggering the Bonus Free Spins feature. 3, 4 or 5 scatters appearing at the same time also trigger a scatter payout of 2x, 5x and 100x total bet. Win free spins based on how the fish stays away from the shark. The fish could survive for 25 spins, with a win of 200x stake prize. All wins in this round will be tripled. Receive 10 Free Spins with a 2x multiplier. A shark on Reel 5 attempts to eat the Substitute Teacher, if the shark succeeds the round ends. Should the teacher survive 25 spins, the win will be a 100x stake as Bonus prize. 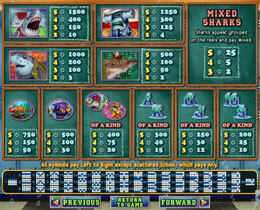 Shark School is a unique, interactive and funny slot with good bonus rounds and nearly 40 winning combinations!